I’ve recently been enjoying the new series by Simon Hopkinson – The Good Cook. His recipes are simple and timeless, reminding me very much of Nigel Slater’s style of cooking – in fact I believe they’re good mates. This braised fennel dish looked particularly good and I decided to serve sit with some fish for dinner. The results were excellent. 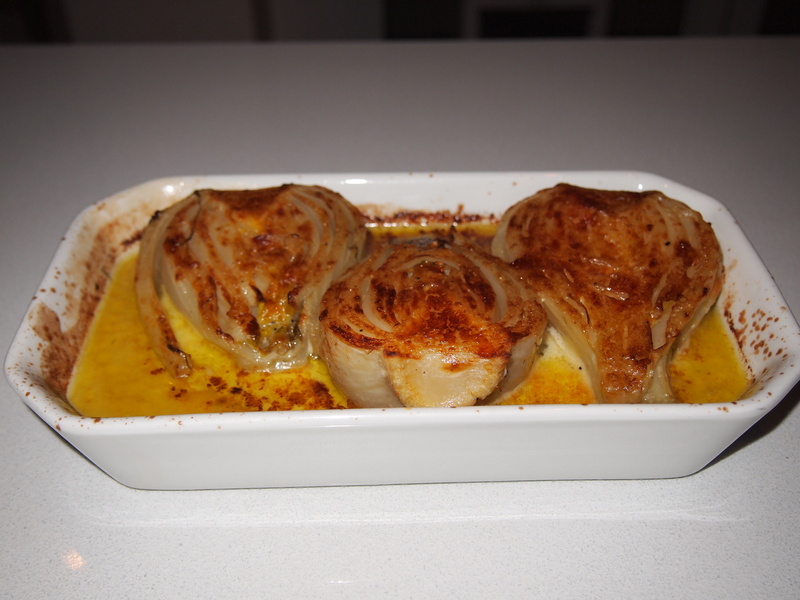 The aniseed flavour of the fennel was nicely muted from the long slow cooking and was buttery soft. The sauce of parmesan and pan juices adding a wonderful savouriness. I’ll definitely be making this one again. Melt the butter in a casserole dish over a low heat. Place the fennel into the butter cut-side down, and scatter around the trimmings. Season with salt and freshly ground black pepper and increase the heat. Add the vermouth and pastis. Cover with a sheet of foil loosely pressed down on the vegetables, and put the lid on top. Place into the oven to cook for 30 minutes. 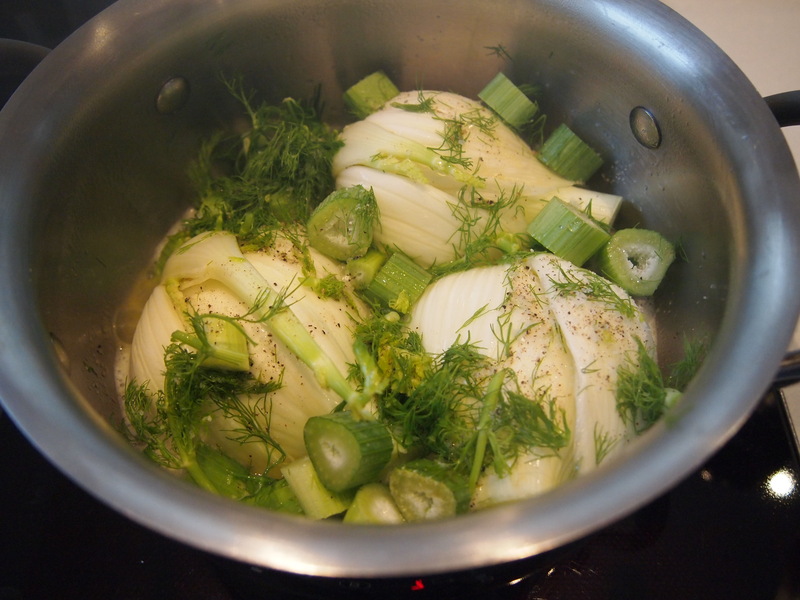 Remove the dish from the oven and turn over the fennel. Return to the oven and cook for a further 30 minutes, or until very tender when poked with a small, sharp knife. 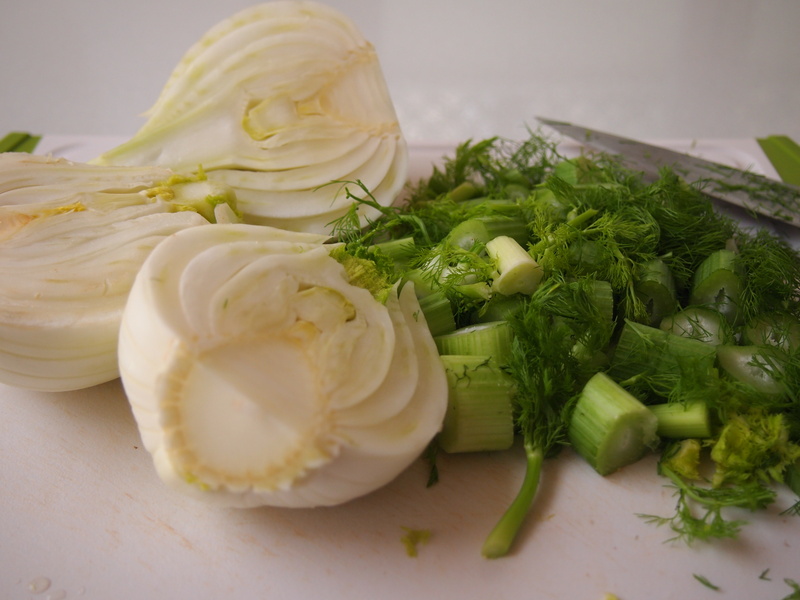 Remove the fennel from the dish. Place in a warmed shallow oven-proof dish cut-side up, cover with foil and place in the oven while you make the sauce. Pour the trimmings and cooking juices through a fine sieve suspended over a small pan. Warm through and add 45g/1½oz of the parmesan. Blend with a hand blender until smooth and creamy (about the consistency of pouring cream). Pour the mixture over the fennel and sprinkle with the remaining cheese. Place under the grill and cook until the surface is pale golden-brown and slightly bubbling around the edges. Serve with extra parmesan for sprinkling over. Hello hello ! :)This looks really yummy. I’ll give it a try sometime. Thanks for leaving a comment! I do have a really delicious recipe for a chicken curry. Not too time consuming but not overly fast. I’ll send to you via email. Tried the Fennel recipe the other night. It was delicious. We had it for dinner (rather than a side) with a green salad. Simple and good. Fennel is nice at the moment and cheap.